Commanders recognized the morale benefits of entertainment for their civilian-soldiers. Early in the war, most units relied on musicians, orators, and singers within their own ranks for entertainment. There were no formal concert parties or performance troops. 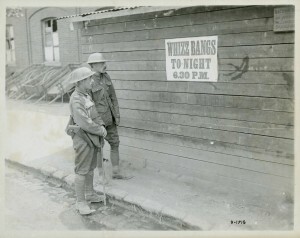 By the Battle of the Somme in 1916, military authorities were encouraging and organizing concert parties for the soldiers during their periods of rest. 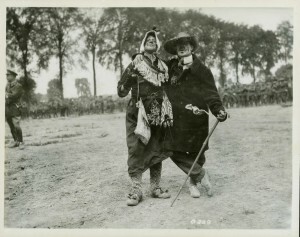 By war’s end, almost every division had its own entertainment troupe, as well as performers in many of the units and formations. 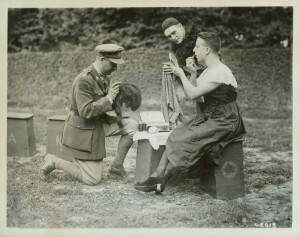 Soldiers were entertained by songs, skits, and cross-dressing vaudeville acts. Most of the dozens of wartime entertainment troupes disappeared when the Canadian Expeditionary Force demobilized in 1919, but a few survived. The Dumbells, which consisted of the best entertainers from several of the wartime entertainment troupes, toured Canada and the United States in the 1920s, allowing veterans to relive the songs, skits, and happy memories of the wartime concerts. 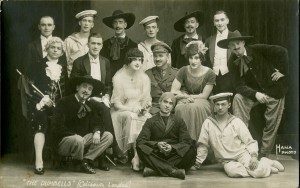 Members of The Dumbells theatre troupe pose at The Coliseum in London, England. The Dumbells, organized by Captain Mert Plunkett, were among of the most famous of the Canadian soldier entertainers. They played to soldiers behind the battlefields and to civilians in London. 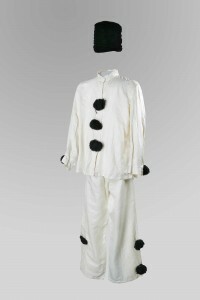 The troupe survived well into the postwar years in Canada, disbanding in 1932. It later reformed for several special events, the last in 1955.